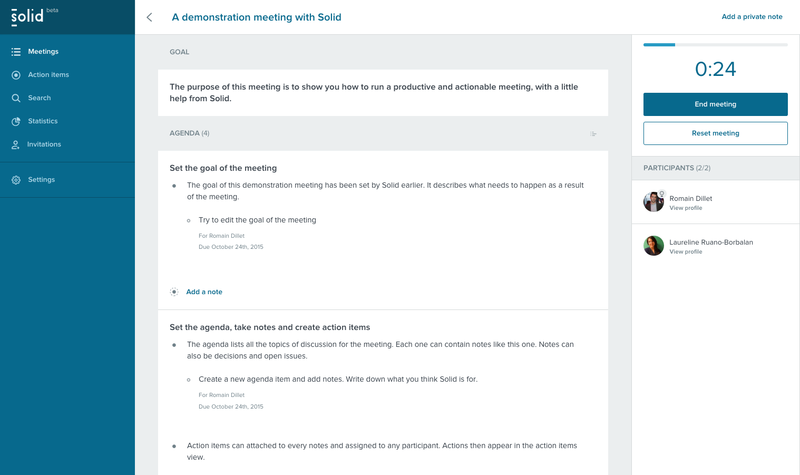 Meet Solid, a brand new service to help you with your meetings, before, during and after they take place. Coming from the team behind Wisembly, Solid is perfect for smaller meetings and smaller companies. So Wisembly now works on two separate products — Wisembly for bigger companies, and Solid. The French company isn’t pivoting, it’s just adding a new additional service. The startup picked a different name to avoid the confusion for existing Wisembly users. “Most of the time, people don’t prepare for meetings, and there is no meeting report from the last one,” David said. How do you automate meetings? First, you sign up using your Google or Office 365 account. Solid will fetch all your meetings from your calendar. Other events in your calendar will be ignored. You can add goals and an agenda in advance. Each agenda item can contain notes. Each note can contain actionable items. You can reorder everything by dragging and dropping, and everything is organized in this rigid structure. Because it’s specifically made for meetings, it’s less daunting than an empty Word document. Once you start the meeting, you can take notes, add documents and keep an eye on the clock. At the end of the meeting, you can export a report in Slack, Evernote or an email. And of course, all your reports stay available in Solid. Finally, you can view some stats about your meetings to see if you’re becoming more efficient over time for example. For now, it’s a free public beta. The company is working on an iOS app.